Emil Carlsen : The South Strand, Skagen, 1917. Location: At lower left and dated. Inscribed with title on backing board verso. 1917 Emil Carlsen [1848-1932], the artist . 2001 Phillips [1796- ], New York, NY, “Sale #NY850 – American paintings”, May 22. 1917 Salmagundi Club [1871- ], New York, NY, “Special auction to benefit the house fund of the Salmagundi Club”, April 12-14. – Soren Emil Carlsen: The Hammershoi of Manhattan by Kim Lykke Jensen, Narayana Press, Gylling, Denmark, 2008, illustrated: color, page 56, figure 38. – Phillips [1796- ], New York, NY, sale catalog, “Sale #NY850 – American paintings”, May 22, 2001, lot #95. – “Special auction to benefit the house fund of the Salmagundi Club [archival photograph]”. Supplied by the Salmagundi Club [1871- ], New York, NY via email March 1, 2018. “Special auction to benefit the house fund of the Salmagundi Club [archival photograph]”. Supplied by the Salmagundi Club [1871- ], New York, NY via email March 1, 2018. 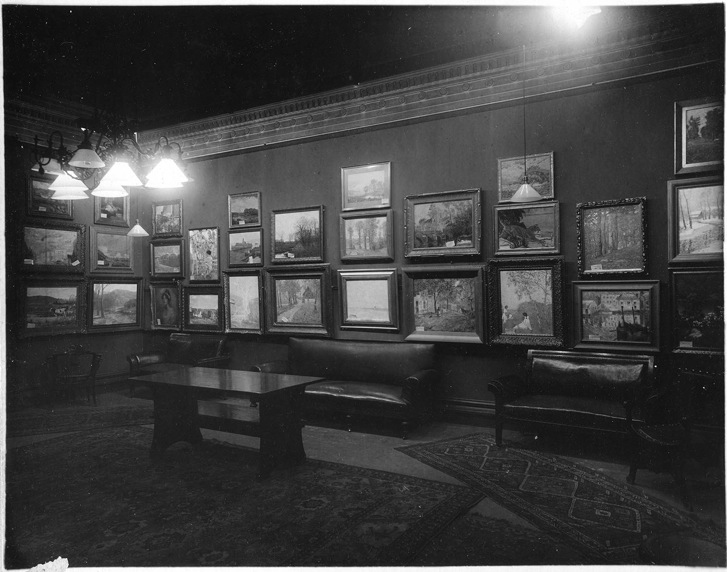 Painting shown at center bottom.